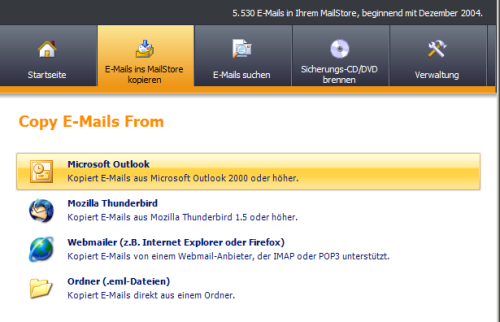 Due to an archaeological coincidence we can present here on the blog two screenshots which show the appearance of a forebear of MailStore Home. 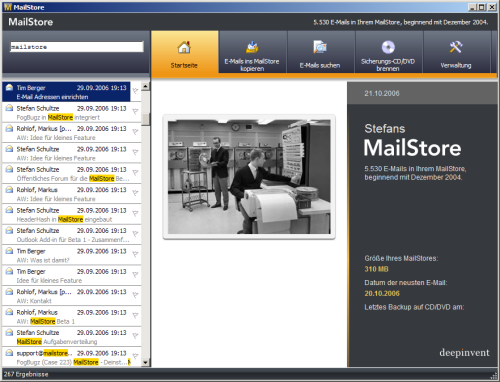 The MailStore user interface in 2006 shows a product which is the result of a development started back in 2004. Two years later it came into the limelight. The look-and-feel was precious and contemporary already with impressing large-sized buttons. Some kind of orange was as far as visible – angular fruits appeared later. It started in a little office in Viersen/Germany and disseminated globally since then. More than a million people are part of the “reproductive success” of our tiny little software baby.